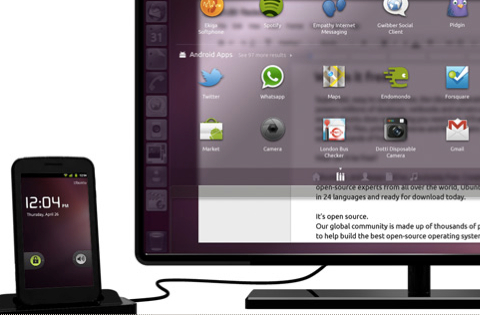 Canonical plans to turn future Android phones into Ubuntu desktops, which could eliminate the need to carry a laptop. The company announced the news on Tuesday and will be demonstrating the solution later this month at the Mobile World Congress. 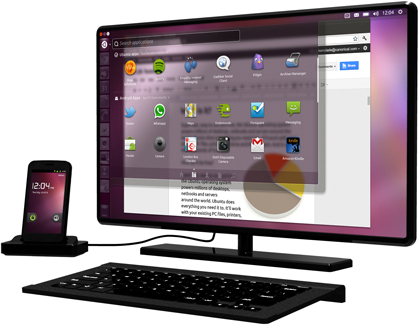 The idea of using a docked phone as a full-fledged desktop computer isn’t new, but Canonical is well suited to make the concept work. All data and services are shared between the Ubuntu and Android environments, which run simultaneously on the device. So Android applications such as contacts, telephony and SMS/MMS messaging are accessible from the Ubuntu interface. Indeed, all data on the smartphone can be accessed at any time, docked or not. As I noted, this idea isn’t new. Most recently, Motorola(s mmi) attempted to implement it a year ago with its Atrix 4G smartphone and lapdock hardware. But the theory was better than the implementation, based on my usage. As a “laptop,” the system was sluggish and very limited: only web applications could be installed in Motorola’s customized version of Linux. I haven’t seen any mention of installable apps for Canonical’s solution, but there are a number of useful pre-installed apps. Another key here is that Canonical has more experience that most with Linux implementations as Ubuntu is arguably the most-used Linux distro. That means it will likely have answers to any problems that Motorola faced with its attempt. And the timing of this move is right for Canonical. I’ve been wondering if we really need the quad-core chips that are coming soon to smartphones — for phone activities and apps, I’m not sold. But phones that become traditional desktops have the potential to benefit from the extra processing power. Is it not like the Motorola Atrix? Option2: take an 11″ air, remove the keyboard, move all other ports to the screen, the hit the shrink button as much as possible. Allow this to be docked, and then sell for the same price as an asus transformer. The issue with these is the OS. Even though Linux maybe cross platform, but not all x86 apps are going to compile well for ARM without major work. option4: get rid of apple products and support these technologies! Kevin, Any of the 2500 + apps compiled for Ubuntu can be installed on a phone in this configuration. App developers who need guidance on how to do this can learn more at http://developer.ubuntu.com/. I was wondering about this. But Chris, aren’t the vast majority of compiled apps compiled for x86? I can see this being really interesting when Intel has competitive (in performance and battery life) smartphone chips. Until then, do we depend on developers to port to ARM? Or is that automated somehow? When it comes to the absolute vast majority of apps on Ubuntu, they are open source and compiled and packaged by the Ubuntu community. It would be up to Canonical and the Ubuntu community to provide them for ARM. It’s the handful of closed-source software that could be a problem if developers refuse to port to ARM, but then that software doesn’t seem to be the most important as most of it is games. Great news, Chris. Thanks for sharing!